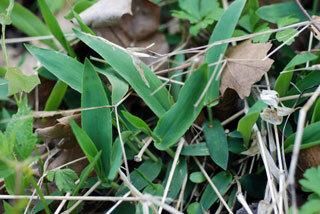 Also Called: Deertongue dichanthelium, deer-tongue rosette grass. Culms: Several in clumps, erect, ascending or arched, unbranched or upper nodes becoming sparsely branched during the summer and autumn, glabrous or short stiff-hairy. Blades: Flat, 4 to 8 inches long, .5 to 1.25 inches wide, ascending to spreading, mid-vein and larger lateral veins prominent; surfaces smooth to rough, marginal hairs near base; base heart-shaped, slightly clasping; tip tapering to point. Sheaths: As long as internodes, lower ones stiff-hairy with spreading hairs. Ligules: Very short ridge or membrane. Inflorescences: Panicle, pyramidal, 3 to 6 inches long, about 3/4 as wide, terminal; branches loosely ascending or spreading, often re-branching 1 or more times. Spikelets: Long-stalked, elliptic-obovate, 1/10 to 1/8 inch long, finely pubescent, borne at ends of branches; first glume 1/3 to 1/2 as long as spikelet, second glume nearly as long as spikelet. Habitat: Woods, brushy areas, banks of streams, roadsides, moist prairie depressions, moist disturbed areas; moist, sandy or rocky soil. Comments: Secondary panicles continue to bloom into autumn.